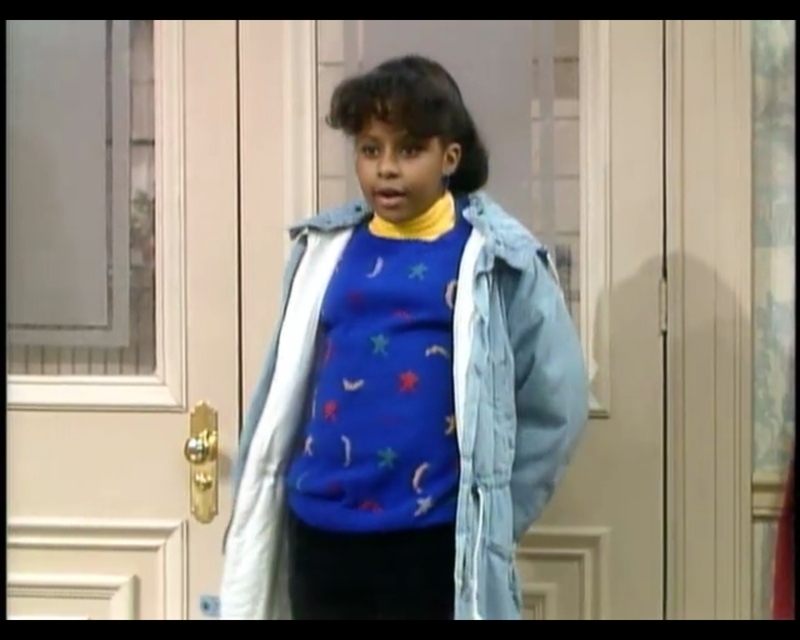 This is one of the episodes that I have remembered since I was just a child, probably because it's so youth-focused that it opens with Keshia Knight Pulliam informing the audience members specifically that this show will be directed at the kids watching. It's a really adorable twenty-odd minutes of television. Each of the tots is cuter than the last, and many of them have special talents like singing a rhyme or being the roundest little boy you have ever seen. 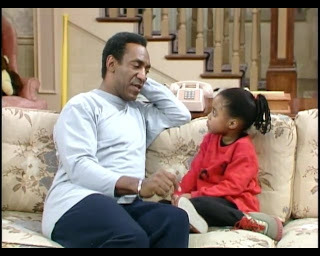 Bill Cosby has a natural gift for interactions with the young'uns, too. It was interesting to watch the level of physical contact he had with the kids; I feel like some of his actions (in particular, the playful slap on the behind he gives to each of the children after the pony ride game) would have been avoided in a modern taping of the same story. But that's an examination for a different day. The problem with a show about a slumber party is that it's really low on fashionable choices. Observe. ... as in My but this Moutfit is Muninteresting. See? Theo throws down an ensemble that is completely unworthy of any attention whatsoever. He's been wearing those jeans, or ones just like them, for months now. Other than that, he's got a sweatshirt. Sure, I could waste your time with examinations of the interplay between the black and red, or the placement of the logo, or his jaunty choice to roll up his sleeves (because that's unexpected), but the truth is that this is one of the dullest arrangements of clothing I can think of, and I don't want to validate it with further attention. The polychromatic heavens weep at your fashion missteps. Vanessa's sweater here marks the beginning of a trend that will continue occasionally throughout the show: hand-me-downs. This Lucky Charms knit first showed up in episode 6 on Denise, and it wasn't any better back then, let me tell you. The look is too young for either of these girls; it would make sense on Rudy, maybe, but that's about where I draw the line. At least she's trying to spruce it up with the yellow turtleneck, but I'm still not convinced. She should also rethink the denim fisherman's coat, which makes her look like a dock worker in a Gap commercial. Eventually, she'll wear only togas before entirely abandoning cloth for chrome and plastic. 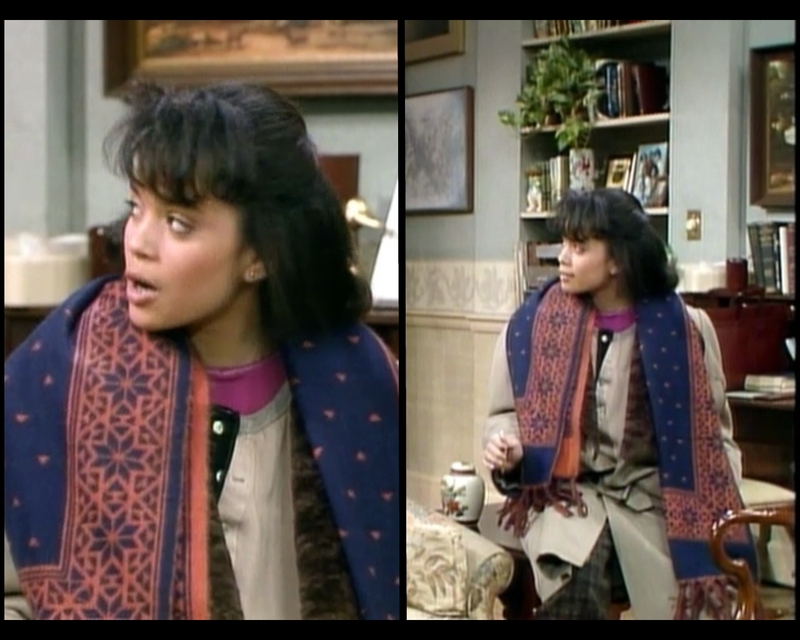 I wish Denise had hung around a little longer so we could have figured out what was buried beneath this coat. As it stands, I can't even tell exactly what's happening with these layers. The jacket seems to have some sort of dark, patterned collar, and then the shirt underneath is also partially khaki, creating this weird optical illusion where you can't tell where one garment ends and the next begins. Thank goodness for that pink undershirt, mostly because I can tell exactly what it is. That giant scarf also deserves mention. It's so big that it barely looks like clothes. It's as if she decided to wear a throw rug or a bed sham or something. 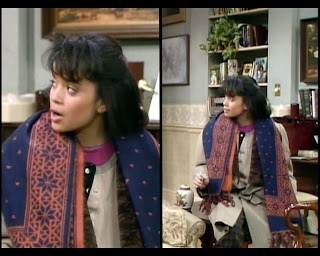 But the colors and patterns are so fabulous that I refuse to deny her the right to put it on her body, even if it used to cover a whole couch. 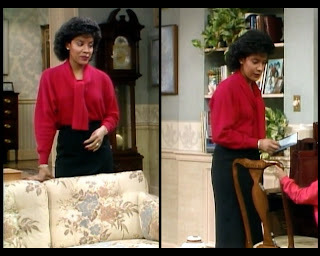 Down in the corner there, you can see her old standby plaid pants, most recently carted out in episode 20. She wore them with a plain, light-colored jacket last time as well; maybe this is how the costume department throws some sass into her wardrobe when her top half is obscured? It's not the worst choice they could make. I hate that thing around her neck so much. Hopefully, she's planning on donning some epic legwarmers before going out. Really, Clair? The rest of your family is dressed for cold. 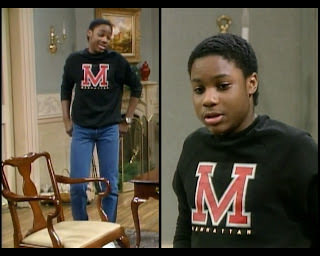 Vanessa has on two sweaters! You're not even going to wear stockings?! You could die of hypothermia. Your legs are lovely, but safety first. Don't leave five children without a mother. "Rudy, are you ever sad that no one blogs about you?" 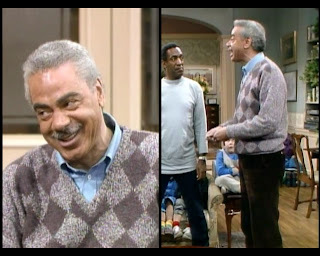 Cliff wears this, which is even duller than Theo's outfit. Even Rudy's outdoing him. Looks like we'll have to turn to the older generation for some wisdom. A master class in class. Earle Hyman makes another triumphant guest appearance as the dapper Russell Huxtable. Part of his fashion success might stem from the fact that we have yet to see Grandpa in his own home; since he's always out, he never gets to fall back on pajamas and loungewear like the rest of his family. As usual, getting out of the house is closely correlated with sartorial success in this show. Getting down to the specifics of his decisions here, I love his consistently austere palette. The pastels above paired with the rich brown of his trousers give an overall warm and inviting look that retains some real elegance. Going for subtlety in the v-neck sweater, he keeps the tonal range pretty narrow while throwing in a tad of fun with the diagonal checker pattern. I wouldn't personally go out in this because I think it reads a little old, but that's kind of the point: he's dressed well for a man his age without looking like he's trying to skew younger. OK, one more thing before we go, because this blew my mind. Which of these children grew up to be famous? One of them is a million-dollar bill. 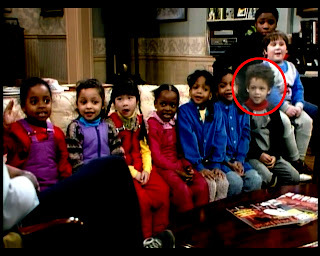 And no, I'm not talking about the Huxtable children, who are famous because of the show. I mean which of these guest stars later made it big? I'll give you a hint. You don't know her name. I'll close on that note, because I have nothing else to say. See you next week, when we get to see a setup for a spin-off that never came to fruition. It's really weird in hindsight watching the producers and writers and actors trying so hard to make "fetch" happen when we all know that this fledgling sitcom completely never got made, or maybe even mentioned again. Between her posture and the denim coat, Vanessa looks pregnant in the second screenshot!! Loved the slumber party details. Thanks for this share. I am also going to get started with the preparations of my daughter’s first birthday. It will be a movie night themed bash so I have booked a local indoor venue NYC and then her friends are going to sleepover together. I am sure it will be the memorable experience for all the kiddos.